The GSC Power-Division S1 cams for the Hyundai Genesis Coupe 4B11T are designed for those with the stock turbo up to the 550hp range These cams will not sacrifice any bottom end loss over stock cams; nothing but gains and will promote faster spooling of the upgraded turbos. Gains of 20-50whp (depending on Turbo) have been seen by simply bolting the S1 cams in. Designed for a rev range of 3000-7500rpms, these cams work well on the stock valve springs. •	the S1 cams work well on the stock valve springs. The GSC Power-Division S2 cams for the Hyundai Genesis Coupe 4B11T are designed for those with 600HP+ in mind. Gains of 20-60whp (depending on Turbo). •	The S2 cams require an upgraded valve spring. The GSC Power-Division S1 cams for the Mitsubishi Evolution X are designed for those with the stock turbo up to the 550hp range These cams will not sacrifice any bottom end loss over stock cams; nothing but gains and will promote faster spooling of the upgraded turbos. Gains of 20-50whp (depending on Turbo) have been seen by simply bolting the S1 cams in. The GSC Power-Division S2 cams for the Mitsu Evolution X are designed for those with 600HP+ in mind. Gains of 40-80whp (depending on Turbo) have been seen by simply bolting the S2 cams in. GSC Power Division has just announced new cams for the JDM/Euro Spec WRX/STI EJ20. Now USDM folk with motor swaps or looking to upgrade their bumpsticks can do so with these top quality billet cores that will outperform other camshafts on the market. 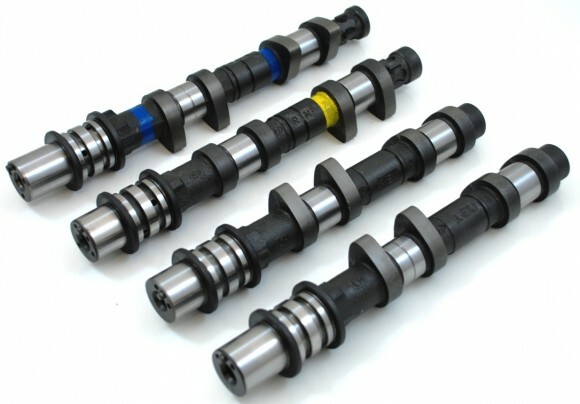 Choose from their streetable S1 Cams, the high horsepower S2 Cams or get crazy with their race only S3 Cams. S1 Cams are good for the stock turbo to a 550hp turbo. 3000-7000rpm range. S2 Cams are built to suite the higher horsepower Subys. With a power range of 500-750, you need some certain mods to utilize the full potential of the S2s such as a built motor and a ported head. 4000-8500 RPM Range. The S3 Cams are built to suite the highest horsepower drag Subys. With a power range of 750-1000HP and a rev range of 4500-9500rpms, The S3 Cams require abuilt motor, with a ported head (clearanced for cam lift), and a standalone engine management system. Dual valve springs are required.